I'm a Christian. I'm proud of my faith, and I love the church. But sometimes my fellow Christians make me want to scream. Like a couple days ago, when a restaurant server posted the following photo to reddit. The story: The pastor was part of a large party who ate at this server's restaurant. Like many American restaurants, this particular one has a policy of adding an automatic 18 percent tip for large parties. It's something the computer does automatically, not something the server has any control over. According to the server, the pastor's party tried to get around the automatic 18 percent tip by asking for separate checks, even though the same person was paying for the whole table. The server says that everyone was happy with the service; they just didn't like the idea of a compulsory tip. The result? The pastor scribbled out the tip, leaving none at all, and adding the note, "I give God 10%. Why do you get 18?" Oh, and just to drive the point home, the diner made sure to add the word "Pastor" above the signature at the bottom. In my book "TORN: Rescuing the Gospel from the Gays-vs.-Christians Debate," I argue that we Christians have often become our own worst enemies. In many communities, our reputation is that of uncompassionate culture warriors, quick to shout about gays or abortion or political candidates, but slow to show grace and mercy in our everyday lives. And these acts of ungrace by Christians have far more power to damage Christianity's reputation and influence than any attack launched at the church from the outside. "But wait," some of my Christian friends have said. "It's not fair to judge the whole church by one ungracious jerk, even if that person is a pastor." I agree, and I know many generous Christians. But unfortunately, this pastor's bad behavior isn't an isolated incident. There are enough Christians out there behaving similarly to give us all a bad name. "Sundays are the worst," one of the servers explained to me. "That's when the church crowd goes out to eat." "What's wrong with the church crowd?" I asked. "Oh, honey," she said. "They're usually the most demanding, and they're always the worst tippers. I guarantee you, if you see your table praying before the meal, you can mentally subtract a third from your tip." Standing nearby, the manager cracked a smile. "They already gave at church," he said. "They don't have any money left." In conversations with my server friends across the country, I've heard the same sentiment echoed time and time again. As a Christian, I find this infuriating. Yes, a lot of us think the tipping system in America could be improved. In many countries, servers are paid a decent wage, and tips are an added incentive to reward a job especially well done. I know a lot of people who think it should be that way in the United States, too. But it's not. In most states, servers are paid only a little over $2 an hour (yes, you read that right), with the expectation that they will make their living from tips. You might not like that system, but if you choose to express your displeasure with it by tipping your server poorly, the only person you're hurting is the server -- someone who is already living on very little money and depending on your tip to help them pay their bills. As a former server myself, I always tip at least 18-20 percent unless the service was just so unbearably horrible that it destroyed the dining experience. Even then, I still tip, just not as much. If I can't afford the tip, I don't eat out, or I eat someplace where diners aren't expected to tip. Otherwise, I consider paying my server to be part of the cost of the meal. I think everyone should tip that way. It's the right thing to do, regardless of your faith, and followers of Jesus are especially called to be generous and give more than people expect. Personally, I'd love to live in a world where non-Christians said of Christians, "I don't agree with their beliefs, but those folks sure do know how to tip!" But if there's nothing I can say to convince you to tip well, then at least do me this one favor: Don't go out to eat after church, don't pray before your meal, and don't sign your receipt with the word "pastor." In short, don't let people know you're a Christian. Because your bad behavior is reflecting on my God and the faith that I love. We Christians are supposed to be the generous ones, not the stingy and selfish ones. 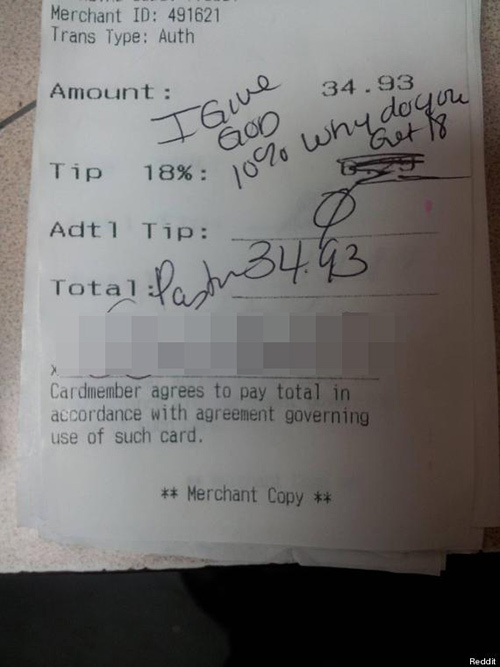 And I can tell you from experience, when servers see a pattern of Christians who tip poorly, it gives them one more reason to distrust anything and everything connected with Christianity. Don't misunderstand me. I know that Christianity isn't about us at all. It's about Jesus. Our human failure to live up to what we believe doesn't make the gospel any less true. But as the old saying goes, we are the only "Jesus" most people will ever see. People inside and outside of the church judge Christianity by what they see in its practitioners. Remember, my fellow Christians: Whatever you do, wherever you go, whenever you tip, you are representing Jesus. And what makes the most difference in that moment isn't your words or your theology; it's your grace, love and generosity. If we miss that, we've missed the Gospel. Justin Lee is the author of 'TORN: Rescuing the Gospel from the Gays-vs.-Christians Debate,' currently available in hardcover and ebook from Jericho Books. He blogs at Crumbs from the Communion Table.